Getting a clean, comfortable shave can be a challenge when using the wrong type of razor blade. You want a quality brand that offers a sharp blade along with safety features. Longevity and consistency are elements that will give you a good shave every time, and you can find these in a quality double-edged razor blade. 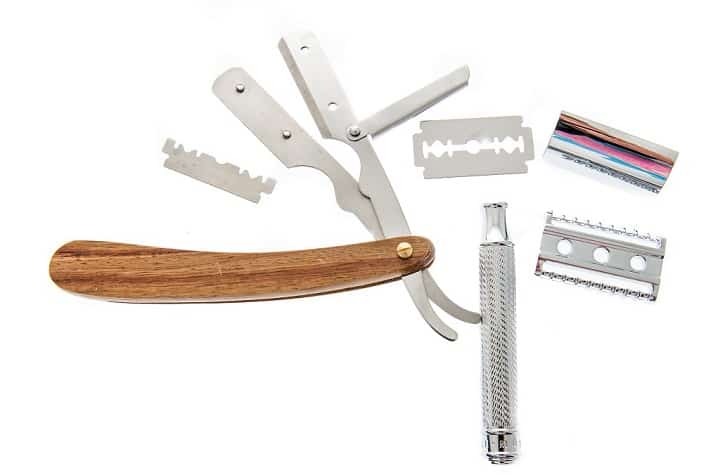 In this buyer’s guide, we will cover the basics of finding the right safety razor blade for you to prevent ingrown hairs, nicks. and cuts. A top grooming set and consistent routine will help you attain a beard you’re proud of! A safety razor blade is a blend of a disposable razor and a straight one. They are popular selections among men because of the professional looking shave they offer. However, while they are popular, not all of them are worthy of purchase. Each one differs slightly, bringing a different set of results for each man. There are a few types of safety blades that differ in sharpness, durability, and of course, price. The best option for you depends on your personal likes and preferences. What is important to you? Are you looking for sharpness or perhaps something less aggressive? Your experience level will help you decide which one is right for you. You will notice that prices range significantly. If you’re unsure of which one is for you, we suggest investing in a smaller pack, to begin with. Once you find one that you want to stick with, we recommend buying in bulk as it will save you money. In the world of shaving, there is a constant debate of safety razor vs cartridge razors and which one is better. Safety razors offer an old-fashioned style. A safety razor offers a higher learning curve and a higher initial investment in comparison to a cartridge one. On the other hand, a few disadvantages of a cartridge option are a lower quality shave, increased possibility of skin irritation, and more expensive long-term. You will save money. Razor cartridges add up over time as does purchasing an entirely new blade every time you shave. Long term, you will save a significant amount of money when you switch to a double-edged option. Using this type of razor means you will be helping the environment by not throwing away disposable plastic cartridges. Instead, you will only dispose of a single razor. Due to the heavier and sharper blade, you’ll use less pressure when shaving, resulting in a close shave. This reduces irritation and will give you a shave you’ll love. Have you noticed that your razor cartridges tend to get filled with hair and bacteria? This leads to several problems such as acne, razor burn, and irritation. You will be impressed by how long a double-edged option can last. They are extremely durable and will last a lifetime! While there is not one exact way to shave using a safety razor, there are some general guidelines you should follow to avoid cuts and nicks. Be sure to have the best styptic pencil on hand to heal this problem right away. Regardless of the blade that you decide to go with, you can follow these steps to increase the quality of your shave. Splash your face with warm water and use a cleanser to remove dirt from your skin. The best face wash for men depends entirely on your skin type and preferences. Afterward, apply pre-shave oil to moisturize and lubricate your skin and get it ready for a clean shave. If you suffer from dry skin, you may notice dandruff. It’s a good idea to look into the best dandruff shampoo for men to enhance your shaving experience and limit discomfort or itchiness. This first step is the most important one since your skin needs to be prepped. You only want to shave when you have time to prepare your skin. If you happen to be in a hurry, don’t shave that day. For a more effective shave, you need to use the right tools, among them being a shaving brush. You’ll be so amazed at the thick lather you achieve when using a shaving brush that you’ll never go back to using your hands. To achieve comfortable and long-lasting results, you need to do it right the first time around. When shaving, make sure you have ample time to complete the process without feeling rushed or overwhelmed. If you relax and enjoy the grooming process, you’ll notice better results. After you’ve lathered the area you want to shave, pass the razor over the skin one time. Do not repeat strokes unless you have lathered that same area again. For a smoother shave, use a fresh blade. Doing so will also lessen the chance of irritated skin. Following these 4 tips will get you one step closer to attaining a smooth, clean shave. Consider investing in other professional beard shaping tools such as beard oil or the best electric trimmer on the market for an even smoother end product. The best razor for sensitive skin involves a smooth, less aggressive blade. When we say smooth, we mean one whose cutting angle isn’t as strong. This means you will have to apply a little bit more pressure than expected. Using a smoother option will lessen the chance of cuts and nicks. 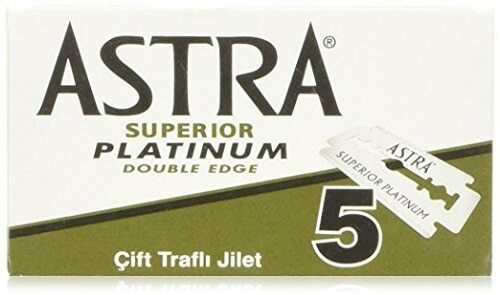 In case you are among men who like double edge razors the most, Astra Platinum Double Edge Safety Razor Blades will sweep you off the feet because they fit all of them. First of, you are going to notice that there are a lot of the blades inside of the pack. To be precise, there is 100 of them, sorted in 5 small packs of 20 blades. Packages are sealed and each of the blades is individually wax paper wrapped. When you want to take one of them out, you can just slide out one little box of 5 blades at a time effortlessly. Usually, you will have 3 to 4 shaves until the blade loses its sharpness, which means they will last you for a pretty decent amount of time. Something that is not so common are the numbers that are shown on the blades so men who like to flip the blade after each shave always know what side comes next. You will get a really close shave every time, with rarely any cuts, bumps, pimples and red spots. This means that sometimes you will be required to do an extra pass or at a different angle to get to all the hairs you want to remove. Outstanding sharpness, smoothness, and comfortability are what makes Feather Double Edge Blades stick out among other safety razor blades on the market. Extreme sharpness is precisely the reason why you should be extra careful when using them. If you are a beginner or still haven’t mastered the technique when it comes to double edge razor, it’s better to look elsewhere. Mistakes with these blades can leave you with deep nicks faster than you can become aware of it. Men who are already skilled with double edge razors, on the other hand, will greatly enjoy them. They cut close and without even a hint of pulling hairs. This product comes with 50 blades, wrapped in 5 packs of 10 blades. The blades are numbered in the corners, so you always know which side you are using. It’s good to know that they are also hi stainless platinum coated, but what’s more important and pretty useful is the back container for disposal of the used blades. Are you just entering the world of safety razors and looking for the ones that work awesome for a completely rookie? 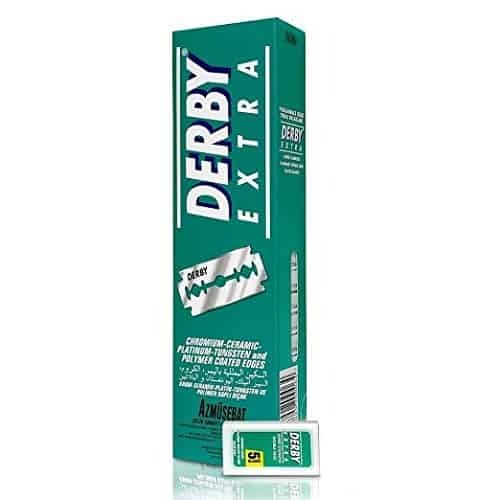 Derby Extra Double Edge Razor Blades may be the right option for you. They fit all types of safety razors and are made from stainless steel. You receive them in 5-count plastic containers, individually wrapped in wax paper. These containers can later be used for disposal of the used blades, precluding you from having to buy separate disposal containers. 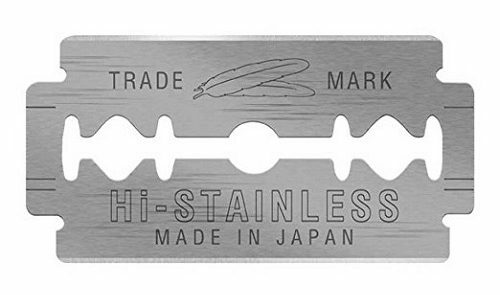 Amazingly, for the price of just 10 cents, you get as much as 100 safety razor blades that provide you with a smooth shave without irritating your skin. Men with sensitive skin will appreciate greatly that these blades are gentle to their skin. No more than three light passes and maybe a few advances over the key areas are just about enough to shave all the unwanted hairs. Number from one to four are stamped in the corners of each blade so you can rotate it and always keep track of which side you are currently using. 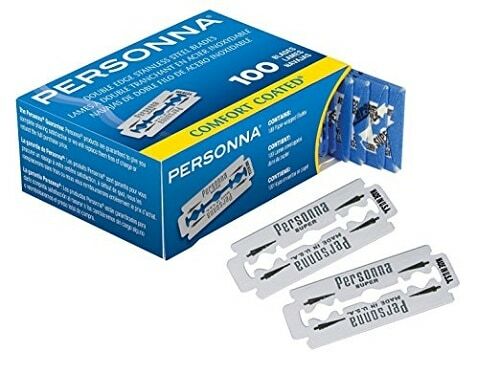 Convenient to be used on most safety razors, Personna Double Edge Razor Blades are glide-coated stainless steel and individually wrapped in a new dispenser carton. This allows you to easily get out one blade at a time from the envelope and also use the empty cartons for disposing of the used products. Don’t expect crazy sharpness from these blades, but do expect a smooth shave no matter the thickness of your beard. Even a man with a coarse and thick facial hair will get at least three shaves from one blade, while men with thinner beards can anticipate to use it 5-6 times. Providing that the blades are not significantly sharp, you will experience far fewer razor burns and less tugging with this product than some other sharper ones. Without sacrificing a close shave, you will get the blades that are pretty forgiving for novices in shaving. Blades themselves are a bit thicker than usual ones, so they don’t bend or chatter. On a side note, if you are into recycling, you will love this product because its package is entirely reusable. The pack of Shark Super Chrome Double Edge Safety Razor Blades contains 100 blades that last for a long time, delivering a smooth, luxurious and comfortable shave every time. This is made possible because the blades are stainless steel and polymer coated. You can use them on almost all types of safety razors. Even though these blades are not overly sharp, they are just sharp enough to glide effortlessly along your skin and give you a close and comfortable shave with no hairs left behind. If your beard is a bit thicker, you might have to go with 3-4 passes to get a close shave, but there will be no irritation, cuts and bumps. That being said, the blades are really forgiving, which makes them ideal for men new to wet shaving. Anticipate getting 2-3 comfortable shaves with each of the 100 blades. A longer duration is to be expected with this product as you get a lot for a small amount of cash. You will probably find it a bit challenging to push the blades out of the small slots. Flipping the slot upside down, then gently sliding the blade should do the trick. It helps if you also press down lightly on end opposite the slot so that the blade angles up and towards it. 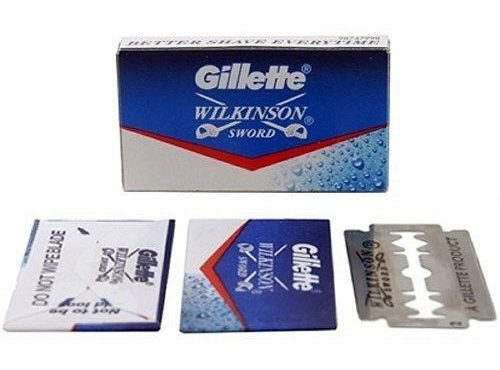 Wilkinson Sword Double Edge Safety Razor Blades are designed to give you the smoothest shave of your life without the ugly nicks and cuts that usually follow. They are pretty sharp and don’t pull your beard hairs. The only exception are the coarser beards, so if you are one of the men with this type of the beard, better look for some other blades. One of the cheapest products from the category of safety razor blades, these items are long lasting and excellent value for the money. They come in two packs of 50 blades inside of each one and fit all straight and butterfly razors. It is already stated that these blades are very sharp, but beware, as they get dull fairly quickly. This shouldn’t make you worry too much because there is a lot of them and will still last you for a long time. The manufacturer is Gillette India, not Germany, so that affects quality a bit. Not sure which blades you should try or you are a complete rookie to wet shaving? 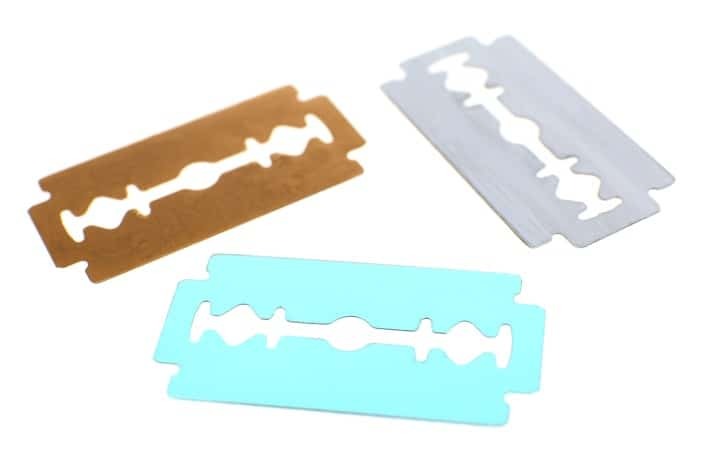 Double Edge Safety Razor Blades Variety Pack will be perfect for you. Nothing on earth can help you more in figuring out which blade works best for you and your skin than trying out 7 different types of the blades found in this variety pack. Inside are the Crystal Super, Astra Stainless, Astra Platinum, Shark Super Chrome, Shark Stainless and 7AM Platinum Sharp Stainless blade. 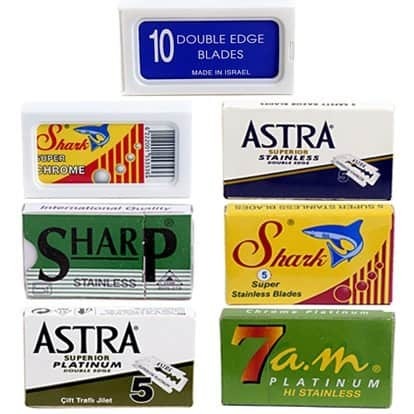 For a meager price, you get 105 double edge safety razor blades from Israel, Egypt, Russia and Asia. It will probably take you a long while to get through all of the blades and discover which ones your skin prefers. After all, at least a box or two of each blade type gives you a pretty good idea of how each one of them performs. One thing is for sure, there is no discussion about the number of shaves you can get out of this pack for a bargain deal price. If you are a beginner and just starting to learn the basics of shaving, consider investing in a less aggressive blade. Knowing how to use shavette will make the transition into a safety razor easier. Once you’ve gotten the hang of wet shaving, you can go for sharper blades. Using a safety razor takes some getting used to, especially if you are used to shaving with a cartridge option. Be sure to have the best alum block brand on hand in the case of minor bleeding. Keep in mind that just because a blade is sharper does not mean it’s better. Like mentioned before, it’s all a matter of personal preference as well as skin type. Some men prefer sharp blades while others find that they irritate their skin. Before purchasing one, consider how sensitive your skin is as well as the coarseness of your hair. It’s likely that you’ll have to try out different brands before finding the one that works wonders for you and your beard. It’s easy to fall under the impression that the best selection on the market will also be the sharpest. However, this is not the case at all. Sharper does not mean better. While they provide a close shave they also increase the risk of cuts – especially if you don’t have a lot of experience using a safety razor. The best double edge safety razor depends entirely on the individual using it. Everyone’s skin and beard hair are different. Consider the type of hair that you have. A good rule of thumb is the thicker your facial hair, the sharper the blade needs to be. If the blade is not aggressive enough, you will struggle to cut through coarse hair. Another factor that affects the quality of a shave includes the shaving cream that is being used. Along with a quality blade, you want to invest in some wash. Regardless of the option you go with, the best blade all comes down to your skin, beard hair, and regimen. Place the jeans or a piece of denim on a flat surface. Point the razor away from you and run it down the denim quickly. Do this about 10-15 times before moving to a different part of the jeans. Repeat this process pushing down firmly and always make sure the top of the razor is away from you so that you don’t ruin your best jeans. When done, rinse with hot water and dry completely. For best results, sharpen and clean after every use. Sharpening and cleaning your blades after every use will increase its lifespan. Use some warm, soapy water to clean out this tool. Dish soap offers good results when trying to remove any gunk that accumulated within the blades. Leave your razor soaking in the water for about 15-30 minutes before drying completely with a cloth (follow the direction of the blade). It normally takes experimenting with a few safety razor blades to find the one right for you. Focus on finding a quality one that gives you a close shave and does not irritate your skin. Consequently, we suggest you look into shampoos and the best beard conditioners in the market to make the most out of your grooming experience. 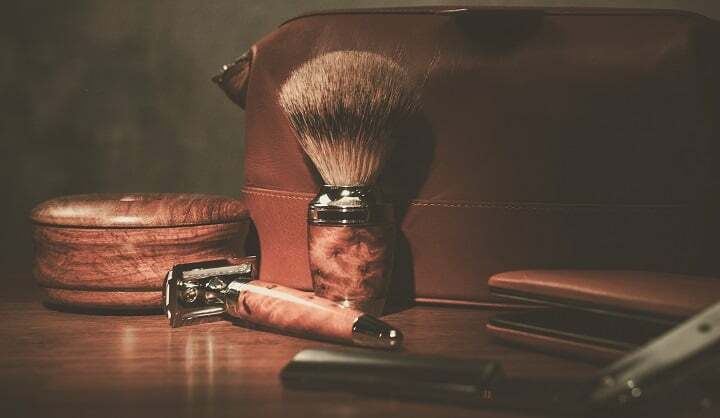 We hope this guide has helped you narrow down the search to land a safety razor blade that offers the shave you desire and deserve! Photos from: belchonock / depositphotos.com, homank76 / depositphotos.com, nejron / depositphotos.com.